Ask fellow campers about "The Old Barn Resort" and nearby attractions. Large campground with plenty of spots for over night camping. Sites are large and grassy. Campground is tiered. The lower part appears to be newer with smaller trees. Bar and restaurant on site. Friendly staff. The only drawback I found was they have pay showers. We camped at The Old Barn Resort in a Travel Trailer. Walk on the grass trail along the perimeter of the campground and you'll get to the river and the old railroad bridge that is now part of the Root River Trail. Beautiful, clean, quiet location on the Root River Bike Trail. Park has a covered pool which can be closed in during cooler weather. Very nice pub with good food. Convenient to Preston and Lanesboro. Golf. Hostel style accommodations for overflow. Very nice park with friendly staff all the way around. We camped at The Old Barn Resort in a Motorhome. The nearby town of Fountain has a small cafe as do the other towns of Lanesboro and Preston. There is a small grocery store (IGA) in Preston. The Root River Bike Trail system is very extensive and a paradise for bikers. We attended a rally. Very nice restaurant on site. A bit dusty and the entrance road was a mess. The last 100 feet were very narrow and no way could two vehicles traveling in opposite directions make it through. Cell reception is poor or non existent for ATT. Verizon was better. No WiFi except at the Barn. OTA TV channels were hard to come by too. We camped at The Old Barn Resort in a Fifth Wheel. (Price is an estimate) The park as a whole was nice. The Old Barn itself was neat, and it had a nice restaurant inside (although not cheap). Our site was right beside the full-timers on the front row, and maneuvering to back the travel trailer was pretty tight. If we had arrived later and there would have been other tow vehicles parked, it would have been very difficult. The space was clean, but not very level front to back; one end of out trailer was very high in the air. There was a fire ring, but we weren't able to use it due to how close it was to the back of our camper; we didn't want any embers to get on the awning. The staff was very pleasant, and the park was clean. Nearby Lanesboro was very nice with a lot of neat things to do. We camped at The Old Barn Resort in a Travel Trailer. A very pretty location, with the huge barn, now converted into restaurant/bar/resort offices at the top of a bluff overlooking the surrounding river valleys. We camped during early season, so were one of the few people there. Resort has covered pool (didn't use), 18 hole golf course, limited access to on property trout stream, located right on the regional bike trail. Campsites are terraced in the hillside going down to river. Large to very large grass sites - lots of space to spread out. Most are very flat and level. Road signs to sites non-existent. May be difficult to very difficult to back into sites when CG is very full, due to single lane roads. Only weak cell service at the Barn bluff, and in highest loop - "A". No service anywhere else in campground. No WiFi at all. TV antenna picked up 13 channels, however. Trash at one end of CG, which can be a very long trek from some sites (no site pickup). 50% seasonal campers, but all very, very well maintained. 2 Day minimum stay (3 on Holidays) required. Restroom/Bath houses old cinderblock, in need of updating, but clean and functional. Coin operated showers. We camped at The Old Barn Resort in a Travel Trailer. Bike trail leads to three nearby small towns, each ~5mi. away, all heavily geared toward bike tourists, especially Lanesboro. Same three towns are the ground zero for a large network of trout streams that attract people from around the country. We camped here with some friends. I guarantee none of us will be back. 1) The roads to the campsites are narrow with a lot of hills. We had a lot of trouble backing into our site due to the huge incline right in front of our site, the narrow road where the edges are washed out, and trees on the site. The highlight of our stay was a resort staff person came out to help guide us out the backside of our site onto the narrow road without plunging (and I mean plunging) over the huge hill on the other side of it after getting stuck in the mud as we tried to center our camper. We couldn't fit our trailer and tow vehicle on the site. Fire pits are located under the trees. 2) Our friends were on the site next to us, and their sewer and electric were right where they're supposed to be, but their water hookup was with ours, and they had to run a hose under their trailer and across their site to get to it. It was really a hassle not to trip over it. 3) There is a bar/restaurant. It is small and busy. The food is mediocre and expensive for what you get. I ordered chips and salsa/cheese - jarred salsa and canned cheese that you get at a ballpark, and I paid around $8 for it. The waitress was crabby, unfriendly and had very little patience for indecisive people. There is very little for older kids to do here. There is a playground, but it is small and geared toward small children. There is an indoor pool, which is open after Labor Day, but really nothing else unless you golf. There was a huge tournament going on the weekend we stayed and couldn't get on the course, and they have no driving range. The oddest part of this "resort" was there is no camp store, and you actually check in for camping at the bar. There are lots of campsites, but only 3 inconveniently located near bathrooms/showers. I never made it to them as they were all too far to walk to - luckily we have a full bathroom in our rig. We won't be back. We camped at The Old Barn Resort in a Travel Trailer. Very nice campground. Grounds are very well kept, managers around quite a bit and helpful. They came around when there was any weather issue. Very strict with the quiet time. Beautiful area. We will be back. We camped at The Old Barn Resort in a Travel Trailer. Old Barn Resort as a campground is a lot of fun. The sites are tighter than we have seen at other campgrounds with your neighbors picnic table less than 5 feet from our motorhome. 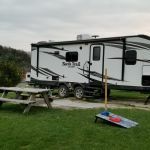 We had a devil of a time leveling the motorhome on the grass site, which we did not have that issue at other grass site campgrounds we have been to. A lot of big dips and mounds in the site. The only real complaint is the gravel roads have washed out at the top of the hills leaving ravines and have basketball sized pot holes in spots which does keep the speed down. There were no bugs at all which is a huge plus especially at night. We did not use or go into the bathrooms but were next to them, and there was a constant stream of people in and out all day long. It would be hard to keep them fully stocked and spotless without a full time attendant. We ate at the bar/restaurant, and the food was good, and service was good considering how busy they were and only two servers. This weekend was the most fun we have had all summer! The access to the bike path is wonderful to bike for a short time or make a day of it! The path has spots to stop and rest, enjoy the view of the river, or have a picnic. The people we ran into were all very friendly and seemed to be having a great time. The tubing on the river appears to be a huge hit, and although we did not do that, plenty of others were! The golf course was very fun to play, with a nice mixture of long and short holes. Beautiful scenery. We will definitely come back. We camped at The Old Barn Resort in a Motorhome. Wow: was told quiet hours start at 10pm. The campground felt like downtown Minneapolis at 1AM. The party did not wind down until 4AM. We left at 6:30am. Off to Whitewater for some much needed sleep. I did receive a refund for the next booked night. We camped at The Old Barn Resort in a Travel Trailer. This is a nice campground with beautiful surroundings, but the bathrooms didn't have soap. Has a good restaurant and wide sites. They have a problem with thieves stealing coolers: put away all your valuables at night because there is no security. Otherwise this is a nice campground. We camped at The Old Barn Resort in a Travel Trailer. Very hard to get reservation. Restrooms were very dirty and no toilet paper especially in morning. Pool was nice. Neat barn structure. We camped at The Old Barn Resort in a Travel Trailer. We stayed here during the July 4th weekend for two years in a row now. Several members of our family from SD, MN, and WI showed up so its a good compromise place. Also quite a few of us are bicyclists and this campground is connected to a 5 star trail. Other then that its not really that great. The A row is the best with limited shaded areas. As mentioned, rules are rarely enforced after the quiet hours. Cooperative staff though and we did have a nice time. Just nothing special if you aren't a golfer. WiFi didn't work for my computer. We camped at The Old Barn Resort in a Tent Trailer. If you're a golfer, this is a great campground. 18 hole course on-site and is a very nice course. For the kids, there is a small playground and a pool. On-site bar and grill wasn't too bad at all. All of the spots are pretty small, no parking pads, just grass. Very few trees. Gets pretty crowded on weekends. Convenient location to several nice cities. We camped at The Old Barn Resort in a Fifth Wheel. Campground is "OK". Lots of seasonals in rows built along a tiered hill. We camped in row-A, the bathouse was down a hill below the next row of seasonals. During the week you could cut through the seasonals to get there (don't tell anyone). A dumpster sat in front of the bathouse and I think something died in there while we were there. At night you needed almost needed a flashlight to find your way around to the mens room on the backside of the building. Camping spots only had shade toward west/south so only got some shade in evening (July). Bathrooms-showers were plain cement floor. I would say the mens room was "clean" but wife said hers was not. Showers took a quarter, and there is nothing to put your clothes on or a bench or anything. On the floor next to the shower was the only place. It was clean, just could use a few minor (inexpensive) touchups. A few benches and some rubber mats to stand on after a shower would be nice. Other campgrounds lack these simple amenities and I still can't figure out why. The little "shack" of a campstore is open during limited hours but they had a fair amount of things if you didn't bring something. The pool was nice, and if you're a golfer (I'm not), it looks like a popular place for golfing. The barn had a nice restaurant. They had good wood and a good-sized bundle which lasted us several nights to make a small fire to enjoy and eat s'mores. There was a small playground for little kids. At night you could see the bright stars in the sky. Next time, we'll likely stay at Eagle Cliff campground just south and east of Lanesboro. We camped at The Old Barn Resort in a Tent Trailer. Sites "down the hill" were plenty big to have a campfire, park the bikes, and still have room for recreation. Great set ups if you have a trailer, and are camping with friends who only have tents. Several bathrooms make it a short walk. Having a bike here is a must, since the nearby trail is over 50 miles of great pavement, and plenty of geo-caches. We will come here again and make it part of the family campsite rotation! We camped at The Old Barn Resort in a Travel Trailer. Are you affiliated with The Old Barn Resort ?